Love Is In The Air At Mohegan Sun! 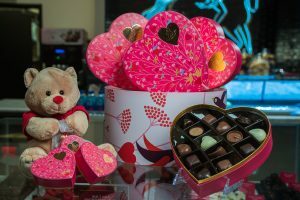 UNCASVILLE, CT (February 5, 2019) – Valentine’s Day is Thursday, February 14th and Mohegan Sun is celebrating with delicious special menu items, sweet dessert specials, and exclusive shopping deals. Enjoy a special meal with a loved one at some of Mohegan Sun’s premiere restaurants. UNCASVILLE, CT (January 22, 2018) – Make this Valentine’s Day extra special at Mohegan Sun and enjoy dining and shopping deals offered at Pasta Vita, Hash House A Go Go, Sushi Koya, Splendeur – A Luxury Boutique, Victoria’s Secret and more. From dinner for two, to delicious sweet treats, the perfect retail deals and live entertainment, Mohegan Sun has everything to make your day one to remember. UNCASVILLE, CT (January 20, 2015) – Love is in the air this Valentine’s Day at Mohegan Sun. On February 14th, guests can enjoy special hotel packages, shopping specials from Galina’s, Landau and Bluwire with dining specials at Todd English’s Tuscany, The Lansdowne Irish Pub & Music House and Jasper White’s Summer Shack – just to name a few! Treat your Valentine to more than just conversation hearts and a teddy bear this Valentine’s Day and visit Mohegan Sun where specials are plentiful at shops and restaurants all over property! Start with a romantic dinner at either Ballo Italian Restaurant & Social Club or Todd English’s Tuscany where delicious specials are being served. Valentine’s Day is approaching and Mohegan Sun is the prime destination for exclusive dining options, Elemis Spa specials, a singles night and great discounts at Mohegan Sun shops. Legendary performer Tony Bennett will be hosting a very special concert live at Mohegan Sun Arena on Sunday, February 14th at 7:30pm. Make Mohegan Sun your one-stop Valentine’s Day shopping destination, with treats for your sweet from jewelry to candles, apparel, dining and more. To help you choose the perfect gift, several of The Shops at Mohegan Sun will offer specials to please your loved ones and your wallet.